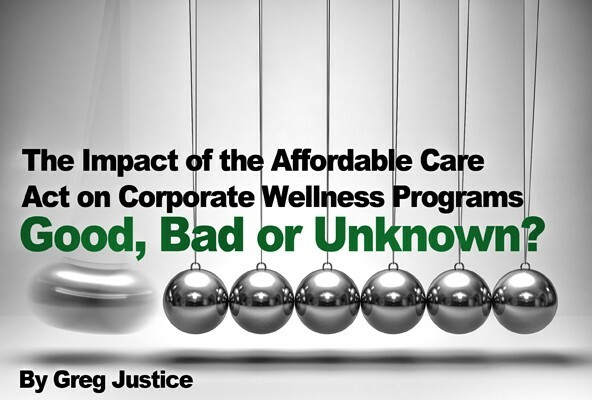 The Impact of PPACA on Corporate Wellness Programs - Good, Bad or Unknown? One of the major thrusts of the Patient Protection and Affordable Care Act (PPACA) is an increased focus on prevention and wellness, as opposed to a historical federal focus on responding to disease and injury as they become apparent and reach epidemic proportions. Although there are many unknowns, both in the application of the PPACA, and the effect of prevention and wellness programs on individuals making lifestyle choices, wellness programs are seen as one of the few constructs available that might modify behavior and result in a healthier population overall. Only time will tell whether the intersection of the PPACA and the concept of employer-sponsored wellness programs net a discernible benefit or interrupts current momentum in the growth of such programs. The Affordable Care Act certainly acknowledges the existence and benefits of employer-based wellness programs. From 2011 to 2015 the Act provides $200 million in grant funds to assist small employers with the implementation of wellness programs. "Small employers" are defined as those with fewer than 100 employees working 25 or more hours per week. The grants are eligible only for those employers who have not already embarked upon a wellness program, and other criteria apply. In addition to these grants, the PPACA provides for technical assistance to employers seeking to implement and manage a wellness program and will be conducting surveys and studies regarding wellness program structures and results throughout the nation. Another provision in the Act increases the health insurance premium discounts an employer can extend to employees who participate in wellness programs. Prior to the passage of the Act, such discounts were limited to 20 percent of the cost. Under the Act, the discount can now be up to 30 percent, and may even reach 50 percent under some circumstances. Providing discounts to participants can be seen as a punitive measure taken against non-participants, and employers are required to adhere to guidelines that assure a nondiscriminatory implementation of such incentives. An acknowledgement of the importance of workplace wellness programs is implicit in their inclusion within the healthcare law. However, there are some provisions, which may not be interpreted as being quite so favorable. The PPACA establishes prevention and public health outreaches that would appear to compete with employer-based programs. These outreaches are community-based and will be funded more aggressively than the workplace-related programs, starting at $500 million in 2010 and increasing to $2 billion in 2015. Employers will continue to fund wellness programs predominantly on their own, whether directly, or through their health care insurance premiums. These community-based programs may compete directly with employers and reduce participation in the employer-sponsored program. For the employees and their families, this is of little consequence, and more choice is generally a good thing for the consumer. The employees will choose the program that suits them the best, and will use it as they see fit. But for the employer, reduced participation in their workplace program could have a negative effect on their insurance pricing, even though the employees themselves are becoming healthier. Some insurance carriers require a certain percentage of employees participate in a wellness program in order to allow a discount in the company's healthcare insurance premium. If discounts are available to individual employees, and employee utilizing a program outside the employer may not be eligible. The employees that choose to use a community-based program may also be creating hardship for other employees by not participating in the employer-sponsored plan. Employers may also find themselves thwarted in their attempts to provide wellness programs through their insurers. The PPACA mandates minimum percentages of premium dollars to be spent on clinical or quality services. A wellness program will likely not qualify as either, although the law does not specifically define those services at this time. Many insurers will need to extract their wellness programs from their suite of free value-added services and provide them only at a cost, or will terminate them altogether in order to comply with these mandates. Employers will then need to pay the insurance company separately for wellness program services or will need to contract with wellness program vendors. Either way, they will be incurring additional costs. If an employer is faced with this decision regarding funding of the workplace wellness program at a juncture where the program has not yet proven its value in reduced absenteeism and increased productivity, it is quite possible the employer will not continue to provide such a program. And, unfortunately, since the employer was already engaged in a wellness program offering, it would be unable to qualify for one of the Act's grants to offset these increased costs so that it could continue with its program. The Affordable Care Act also provides for a nationwide study of wellness programs, which could result in statistically meaningful information regarding outcomes, productivity, absenteeism, improvement in health characteristics and other metrics. Unfortunately, several of the metrics to be monitored by the administrators of the national study to produce this valuable information are beyond the scope of what is currently considered proper and respectful of employees' privacy regarding healthcare information in the work place. Section 4303 of Title IV of the Act indicates the following metrics will be assessed: Employees' health behaviors, health outcomes and health care expenditures; and Changes in the health status of employees, absenteeism, productivity, rate of workplace injury, and medical costs incurred by employees. In order to avoid even the appearance of impropriety, and to avoid any implication of discriminatory behavior, many employers studiously avoid knowledge of several of the above metrics. Employees' fear of being taken to task regarding such issues as health outcomes, health care expenditures and health-related absenteeism is a concern that works against employee acceptance of a wellness program in the first place. If the employer has a self-insured plan, human resources personnel take care to avoid employee-specific cost analysis to ensure employee privacy. If the plan is a commercial one, the human resources personnel tend to have less of an opportunity to come into contact with employee-specific information in the first place. Even with workers compensation claims, employee medical information is closely guarded, and the employer receives only those details needed to determine the duties to which the employee may be returned, and the probable time frame in which that return may occur. Employees gain a significant level of comfort with wellness programs when they understand that their participation is completely voluntary, that they won't be judged for good or ill based on whether they choose to participate, and no one is watching over them to ensure that their health improves due to participation. This federal study will compromise the painstakingly developed reinforcement of employees' privacy in these regards and could well have a chilling effect on their desire to participate in their employer's program, even if they have been participating previously. The downside to this is obvious and multi-faceted. The employees will lose the benefit of their participation in a wellness program, regardless of how marginal that benefit may have been. The employer will lose the benefit of that employee's participation in the program. And the study will be skewed by the employees who prefer less intrusion into their healthcare specifics being under-represented in the demographic studied. This does not bode well for a statistically sound result from the study. Concerns about the erosion of employees' privacy were voiced frequently prior to the passage of the Act. Reconciling those concerns with the required metrics and analysis seems a nearly impossible task. By contrast, the community-based programs sponsored by the Prevent and Public Health Fund do not specify metrics to be gathered from subject individuals. The pertinent subsection of Title IV, Section 4003 indicates that the Community Preventive Services Task Force has the duty to assess, every five years, "the health effects of interventions, including health impact assessment and population health modeling "Between the kinder, gentler evaluation of community-based programs, and the extraordinary disparity in funding, it's not hard to imagine that workplace wellness programs will quickly be eclipsed by their community-based counterparts. For those employers that participate in PPACA-established state insurance exchanges, wellness programs may net no benefit related to insurance costs. The state insurance exchanges are allowed to utilize only very limited criteria in establishing their premium rates. Participation in wellness programs does not appear to be an authorized criterion at this time. The criteria could be subject to change, as the exchanges are not yet active, and many rules, regulations, procedures and details have yet to be formulated and promulgated. Overall, the impact of the PPACA upon the implementation and continued use of workplace wellness programs appears to be a mixed bag. The Act is generally supportive of wellness programs, encouraging and supporting them in the workplace, the community, and for persons insured by individual plans. But the Act also brings unique pressures to bear upon wellness programs in the workplace by requiring intrusive metrics for federal analysis and creating and significantly funding competing programs. Greg Justice, MA owner of AYC Health & Fitness, Kansas City's Original Personal Training Center and founder of Corporate Boot Camp System has been actively involved in the fitness industry since the early 80s. His growing network of Trainers spans 9 countries, 45 states, and 6 Canadian Provinces, helping fill the gap in corporate wellness with on-site workplace exercise programs. Speaker, author, and coach, Greg can be reached at aycfit@gmail.com.